The best colored pencils can be found in this collection! Whether you are a beginner or a professional artist searching for the boldest pencils, we’ve got you covered. Art is in the eye of the beholder, but quality colored pencils must reach the standards of our reviewers to be included here. We’ve researched to find the very best. Now: Before you check out the reviews below, here’s what you need to know in order to shop wisely. Count - Some of the items we’ve chosen include over 100 colored pencils. Other sets are a little more minimal. You’re going to want to know how many pencils you’re getting with your purchase, so we have that information available here. Pack - The right colored pencils can bring your creations alive. Check here to see if the set you’ve picked comes with just 1 set, or more, of the colors you love. Knowing the number of packs included will help you to be prepared. Pre-Sharpened - The amount a pencil is sharpened can entirely change its saturation and the mark it makes on the page. If the set you prefer does not come pre-sharpened, you may also want to invest in a quality sharpener. Pencil Length - Pencil length is marked in our easy-to-read guide so that you know the pencil size you’ll be working with. Some pencils are designed for adults, and others are meant for children. This category will give you a clearer picture. Case - Certain colored pencil sets come in handy carrying cases for transportation. That allows you to take your work on the go, to the park, while traveling, and more. Check here and see if your pencils come with a case. Certification - It may surprise you, but there are a number of certifications available for colored pencils, ranging from ASTM certification to the PMA Certification Seal. We’ll tell you if they’re included on the pencils you’re eyeing, and what they mean! Now that you have a better idea of what to look for when shopping for colored pencils, it’s officially time to begin. Here’s the deal: if you don’t have a lot of time to shop, look at our top pick and our budget pick. Both are excellent choices for the eager artist. Below those, you’ll find the remaining 8 top contenders selected by our reviewers. We can help you find the best colored pencils for you – let’s get started! Are you an artist with an all-or-nothing attitude when it comes to your craft? 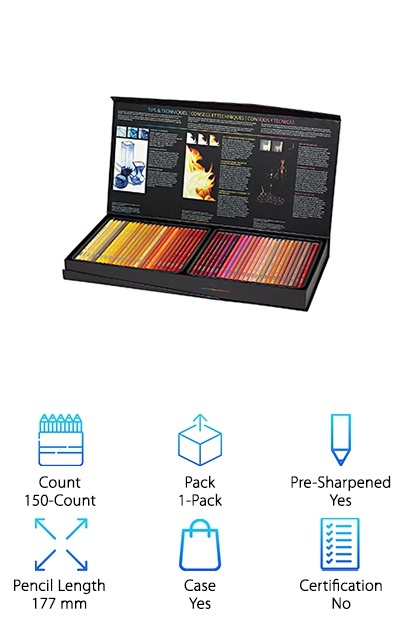 This colored pencil set will leave you awestruck. The best colored pencils for adults are included in this collection, and we named the Prismacolor Premier Colored Pencils set our top pick for many reasons. Just listen to some of the colors included in this 150-pencil set: Sunburst Yellow, Copenhagen Blue, Apple Green and Poppy Red. These 7-inch pencils contain soft cores, so the vibrantly-hued lead can improve your shading and shadowing game. They are thick and durable, so they won’t break easily. Since they won’t be cracking and chipping, they are wonderful choices for adult coloring books. Create true works of art with a true artist’s set! These 150 pencils come lined up beautifully in a case, making them transportable and easy to sort through. The case contains 6 different levels of expertly-crafted pencils, all sorted by shade. Picture this: No color is repeated! What brand do you associate with a happy childhood, full of simple joys? For us, that brand is Crayola. That’s why we selected Crayola Colored Pencils as our budget pick! It was an easy choice: Crayola has been making quality products since the company was founded in New York back in 1885. 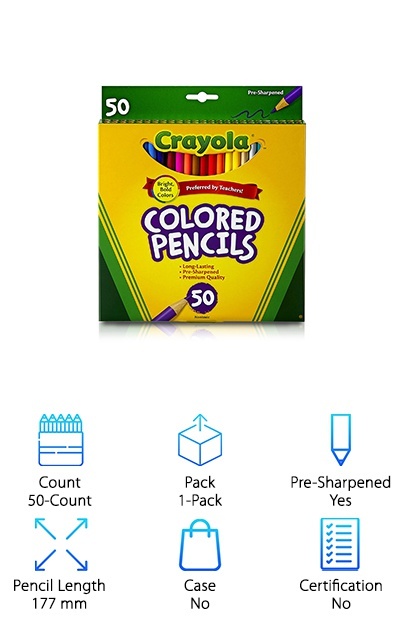 With this purchase, you will get 50 colored pencils, ready for drawing. They come pre-sharpened! And it gets better: these pencils are for everyone, not just adults. They make a wonderful gift for kids ages 6 and up. With these brand-new tools, your child can let their imagination run wild. They are also wonderful for everything from school homework projects to detailed, professional artwork. These are soft-leaded pencils, and they will hold up against the pressure from both little and big hands. Let your family create new masterpieces destined for the place of honor on the fridge! Coloring can be fun to do, all together at home. New art supplies are a special gift because they unlock imaginations at every age. In school, arts and crafts was a time for experimentation and discovery. Now, as adults, we're all buying adult coloring books and more to rediscover that feeling of endless possibility. It's also soothing to the mind to focus on images of gardens and butterflies instead of dealing with the stresses of daily life! The Castle Art Colored Pencil Set pencils are some of the best colored pencils for coloring books. And that goes for both kids and grown-ups! 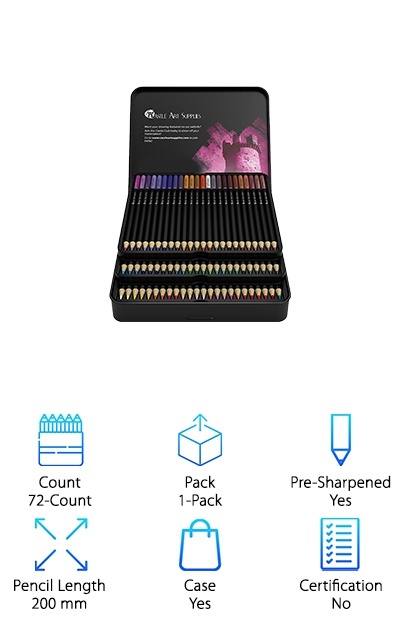 Here’s why: the set comes with a whopping 72 pencils in every shade from white to black, and the entire spectrum in between. They are pre-sharpened, so you can begin coloring right out of the box. The lead core is strong, to prevent breakage. You’ll find these to be a wonderful companion for shading and layering colors in your artwork. Purchase a case and draw away! Does your life need some more vigorous color? When things get a little stressful, could you use some doodling time to decompress? Our reviewers picked out some of the best colored pencils for adult coloring books. These are perfect for picking up and coloring cityscapes, still lifes and more. 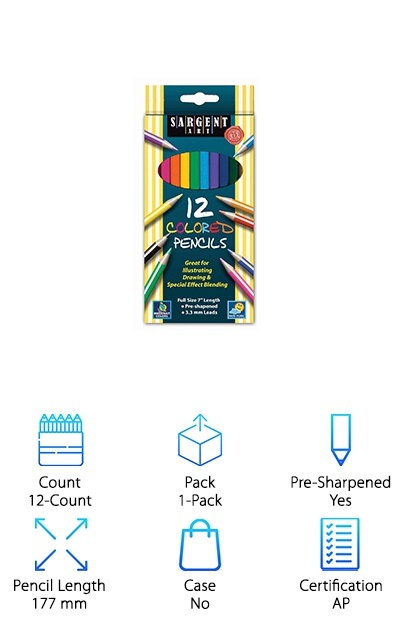 The Sargent Art Assorted Colored Pencils are a wonderful set for a beginner, with the following colors included in the box: orange, brown, blue, violet, black, yellow, light green, dark green, dark red, rose pink, white, and light blue. Want more? Sargent Art offers packs with up to 52 different colors. There are also 24, 36 and 50-count packs in between. The pencils are pre-sharpened for ease of use. Place new hues on images of sparkling seas and animated faces. And there’s more: these pencils are AP certified. They also come at a very affordable price. Make an investment in art, and add color to your day right away! One of the big questions people have when buying colored pencils is: what do they look like on the page? Are they buttery-soft and blendable, or sharp and vivid with little nuance? Depending on your preference, images can turn out quite different! These Sudee Stile Colored Pencils were selected by our reviewers for their versatility. Wax-based and made with a solid 3.3mm lead, they are made to glide onto your artwork and lay down color beautifully. The pigments are meant to last a long time and can blend together to create new shades. 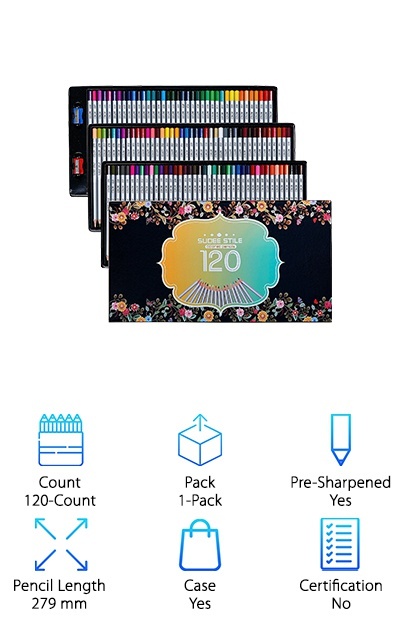 These modestly-priced pencils come in a set of 120, so you have nearly endless choices. Choose from soft yellows, moody blues, tranquil greens and screaming reds. Not only do they come pre-sharpened, you will also get two sharpeners from Sudee Stile for re-sharpening as needed. 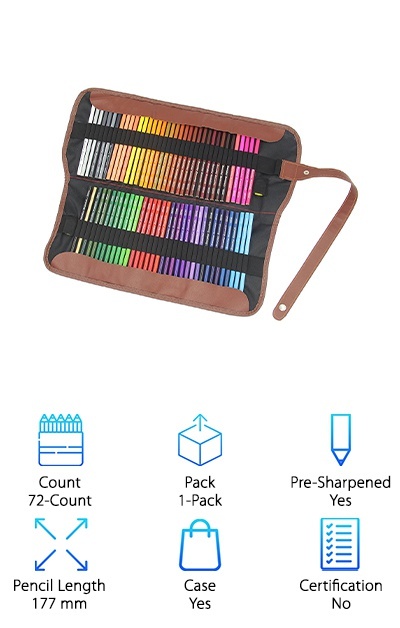 The pencils are laid out in a three-level case, so you never have to hunt down a missing color. The name says it all: these Immersive Pre-Sharpened Colored Pencils allow you to dive into new worlds and be transported by artwork. That goes for artists of any age! 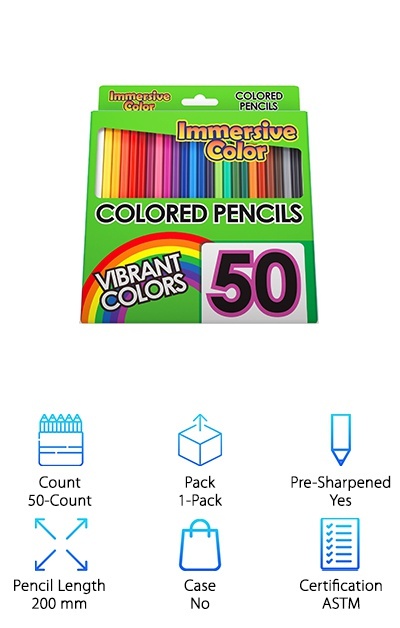 Kids and adults will appreciate the immersive experience this set of colored pencils brings to the young and old alike. You will receive 50 colored pencils, all pre-sharpened and ready to go. With so many choices, there are several shades of every color for your use, even grays, and browns. This affordable set comes boxed and laid out, ready to help you create. These colored pencils are non-toxic and ASTM-approved. What does that mean? ASTM designates the Standard Practice for Labeling Art Materials for Chronic Health Hazard governed by the American Society for Testing and Materials (ASTM). They meet rigorous product labeling and testing requirements recognized all over the globe. Schoolwork will be fun again, grown-ups will discover a well of creativity, and kids will delight in fashioning their own original artwork! The artistic process can be torturous (take Van Gogh, for example, and his poor ear,) but it doesn’t have to be. If you’ve got the right supplies, you’re already halfway there. That’s why our reviewers selected Ohuhu Colored Pencils. 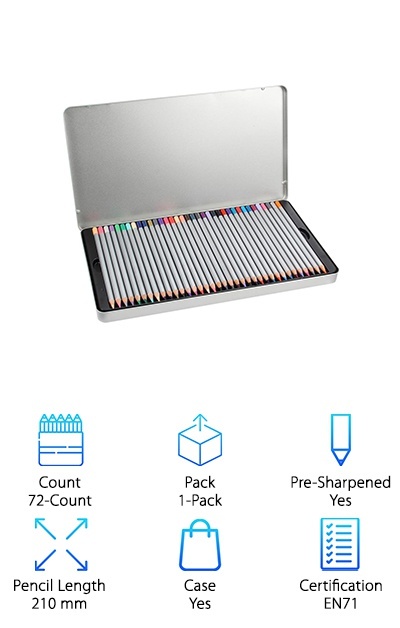 This simple, functional tin case is loaded with 72 pencils for creating artwork of all kinds. They come pre-sharpened, which eliminates another potentially torture-filled task. You’ll marvel at their simple construction and environmentally-friendly design. Why? Because they are each crafted with recycled wood. When it comes to function, you’ll be pleased as well! Ohuhu Colored Pencils are professional-grade and are designed to smooth onto the page, leaving only vivacious color behind. The best colored pencils for adult coloring, like these, are easy to use and stress-free. Kids will love them, too, and they make a stylish present. No need to wrap them, because they come laid out in a multi-level tin case. So, put pencil to paper and make something beautiful! Adult coloring books are booming in popularity because they serve a few different functions. They make the world a prettier place, they’re a fun, light task to tackle, and they can even help to reduce stress. When you select the right pencils to begin your coloring career, it all turns into a win-win. Our expert reviewers just had to let you know about these Wanshui Watercolor Pencils. These multi-faceted tools are made to create all kinds of art. It just depends on whether you use them while dry or wet. Think about it: a few drops of water and these pencils are transformed. Go from full intensity to soft hues. You have an incredible 160 colors to choose from, all displayed prominently in plastic trays. They are all stored inside a clear plastic case with easy-to-use snap closures. 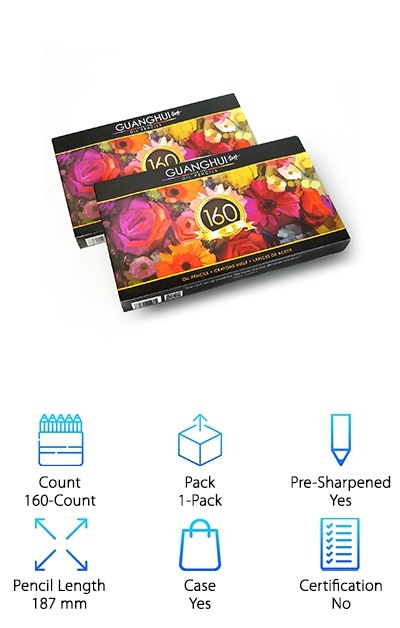 These pencils come pre-sharpened, and in the pack of 160, you won’t get any exact color repetition. The pencils are oil-based. The best colored pencils for both adults and kids are made with professional artist-grade quality, at a reasonable cost. Our reviewers chose these Hero Colored Pencils for Adults because they truly fit the bill. It’s also important to add that while these are marketed toward grown-ups, they’re really the perfect gift for kids as well. Little Timmy won’t be worried about building his class diorama of the Pleistocene Epoch anymore when these arrive in the mail. (Memorizing all of those dinosaur names, however, is a different story.) Little Sally will embrace her studies of cursive when she can write words down in multiple shades of pink AND purple. The phrase “multiple shades” is an understatement, actually. 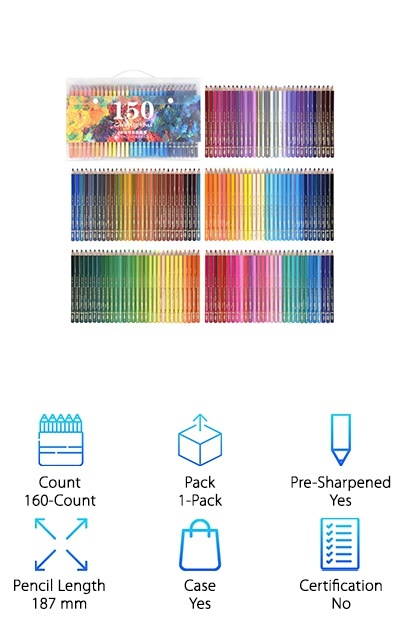 Get this: with the Hero Colored Pencils set, you receive a whopping 160 pencils. And they’re all pre-sharpened! They come in an easy-to-navigate 5-level case, organized by color. You and your kids will discover coloring talent you never knew you possessed! When Michelangelo sketched out the ceiling of the Sistine Chapel, he probably was wishing for a pack of these Everyday Essentials Premium Colored Pencils to make the job go a little more smoothly. All right, perhaps not, but they are a valuable asset for any artist. 72 pencils are included along with a very handy sharpener to fix them right up after some use. You won’t need it for a while, though, since they come pre-sharpened. They will arrive in a canvas bag designed to keep the colors laid out nicely and the tips from breaking, so you can carry them wherever you go. Everyday Essentials Premium Colored Pencils are a favorite for our reviewers because they work for both kids and adults, both amateurs and professionals. The pencils will create hues ranging from soft and lustrous to rich and bold. Pair this kit with an adult coloring book, and you’ve got a hobby that will bring you hours of delight.